Building brands costs a heck lot of money and when the brand goes kaput or is retired all that investment is gone. Typical example: the Zen used to be a revered nameplate, look at what it is today. Rather than spend money on building a new brand then, particularly since this new SUV is not going to replace the Scorpio, the marketing folk opted to strengthen the mother brand - Mahindra. Thus you have the XUV500 (five-double-oh, keep saying it otherwise you'll regress to five hundred). Enough with the lecture, there's a lot to talk about the XUV500 so let's not waste any more time. After slapping onto the Xylo a face that only its mother could love, Mahindra's styling department have rediscovered their mojo with the Mahindra XUV500 in India . The nose is dominated by the latest iteration of the Mahindra family grille that has expanded from the chromed sabre-tooth to a jaw full of canines. Google Jeep Grand Cherokee and you will see the inspiration for the grille but the execution is all Mahindra's and it will work for the Indian audience. The bumpers have deep slashes below the headlamps which cut down on visual mass while also adding to aggression. These aren't air vents though, they're blanked off with the vents being behind the honeycombs on the grille and airdam. The numberplate holder is neatly integrated into the bottom of the bumper and I expect it to stay there; if you recall the Scorpio's number plate had to be shifted as it was obstructing the flow of cooling air. Four years in the making, 2.3million testing kilometers, 250 prototypes and a Rs 650 crore investment will ensure these issues won't crop up. The projector headlamps are similarly highly detailed and this would have been the first Indian SUV with day-time running LED lamps if not for the Force One. It also gets cornering lamps which basically means the fog lamps (which is angled outwards) comes on when the steering wheel is twirled. The profile is dominated by the muscular haunches that cover 17 inch alloys shod with 235/65 Bridgestone Dueler road tyres (of note, there aren't any ungainly wheel arch gaps). The rear haunch is particularly interesting, a distinctive character line that eats into the shoulder and window line and is supposedly inspired by the haunches of the cheetah ready to pounce on its prey in the Savannah. In fact a lot of the communication of the XUV revolves around the Cheetah (which is not found in India by the way) whose paws were also the inspiration for the vertical door handles. That's not it for African themes; the taillamps have this strange tribal motif and the colors too were chosen after parking XUVs in the Masai Mara and observing how it looked under the sun and in the wild. The Cheetah/Africa bit is stretching the point but fact is there is no bad angle to the XUV, unlike the Scorpio where the designers forgot about the rear. The proportions are so compact that you'd be surprised to find three rows of seats. With the third row up boot space is an all but non-existent 93 litres but the seats fold flat into the floor (easily done by a small lever) to liberate a 702-litre boot and the middle row too folds flat to increase boot space to 1512 litres. Accommodation in the third row is good for children and acceptable over short distances for adults. As a yardstick it isn't as comfortable as the Innova though space is almost identical to the Aria. The middle row doesn't slide and there are no individual captain seats for now but space (head, knee and shoulder room) is very good. And unlike the Scorpio where you clamber up, the XUV sports easy ingress and egress thus doing away with ungainly running boards. Up front the seats are wide, comfortable and accommodating and facing the driver is a properly stylish and well turned out dashboard. Panel gaps are tight and these interiors are much, much better than any Mahindra so far. Quality standards though are patchy, while first impressions are very positive some bits do let it down like the flimsy lid for the centre console and coin holders and the nasty serrated edge on the underside of the gear knob of our test vehicle. Like the Xylo different exterior colours get different dashboard shades and while I don't care too much for the browns in our (maroon) test car I did see rather better black and beige jobbies during the launch. An irritant though are the silver-finished strips that originate from the base of the windscreen and flow down the sides of the centre console which cause a nasty reflection on the windscreen particularly at night. And mention must be made of discreet LED lights that illuminate the cabin (the strip on the roof looks almost like on the Audi A8) though the reading lamps (also LEDs) are so bright they're akin to tube lights. Turn on the ignition and the needles do a full sweep of the dials like on sports bikes while the infotainment system plays a welcome tune (which gets irritating after a while but thankfully there's no 'Welcome to your Scorpio, you are driving a powerful vehicle....' nonsense). The dials themselves are terrifically designed and shows just how much thought went into styling the XUV. And then there's the exhaustive feature count. Safety first. Both variants get ABS and two front airbags as standard, the W8 on test here gets ESP and side and curtain airbags for a total of six airbags. There's hill-hold which prevents the vehicle rolling backwards when creeping up an incline and hill-descent which maintains a steady speed (without touching the accelerator or brakes) while going down steep inclines. Creature comforts include climate control with a separate condenser for the rear air-con to ensure optimal cooling even in the third row. In fact third row passengers get their own blower controls and the vents are neatly integrated into the pillars so that there are no ugly protuberances. All rows get charging points and the space under the central armrest is refrigerated. There's two-tone leather upholstery, automatic headlamps and rain-sensing wipers, cruise control and audio controls on the steering wheel, Bluetooth, USB and iPod connectivity and a six-inch full-colour infotainment touch screen that has a full vehicle data display including service intervals, fuel efficiency and tyre pressure indicators (the left rear sensor malfunctioned in heavy rain). Parking sensors with a distance readout is standard and there is a provision to connect a parking camera to the screen. And best of all there's integrated GPS navigation with 1.5 million kilometres of maps spanning 1200 cities and turn-by-turn navigation in eight regional languages. This is as extensive a feature count as is possible; killer value when you look at the sticker price. For a manufacturer that has built Jeep-based products for its entire existence the XUV's monocoque chassis marks a major milestone. The benefits are immediately apparent. Despite being 195mm shorter than the Aria the XUV is just as spacious. It's a significant 440kg lighter. And the dynamics are nothing like you've experienced on a Mahindra. Gone is the top-heavy attitude of the Scorpio; in the XUV the centre of gravity is much lower and you feel you're sitting inside the SUV, not on top of it. The ride quality is a significant improvement over the Scorpio and it works especially well on bad roads. There's this typical Mahindra indestructible feel to the suspension that gives you the confidence to power through bad roads which the XUV soaks up impressively. Stability is good at sane speeds but take it towards its top end and it starts to feel nervous and in the wet it can get a handful. In the city she's not as effortless as a car to potter around but neither is she as cumbersome as an SUV and in that sense she strikes a middle ground between cars and SUVs. The driving position is high so visibility is great and you can bully your way through traffic, the turning circle is small enough to not require three-point turns everywhere and the steering is light and easy. Only problem is the heavy clutch and recalcitrant gearbox which surely will be sorted out soon. The handling is another revelation. The XUV actually generates grip round corners! There's body roll, in significant measure when really pushed, and the tyres love to squeal, but there is grip. The front end bites well and it transitions safely to understeer when pushed harder. It's always predictable, there are never any oh-my-god-what-is-happening-now moments. There's not much steering feel but neither is it completely detached so you do know what the front tyres are up to. And the driving position is spot-on thanks to 8-way adjustable driver's seat and the steering that both tilts and telescopes. There are also disc brakes on all four corners backed up by ABS and ESP. 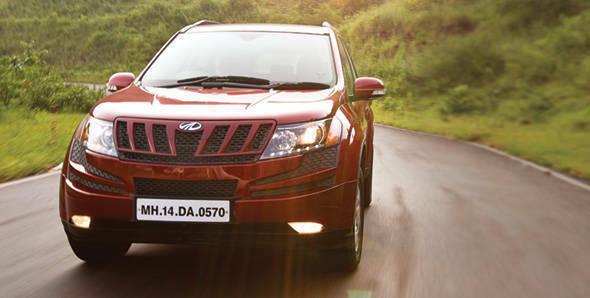 The XUV is also the first Mahindra where the engine is mounted transversely and drive is sent to the front wheels. An all-wheel-drive variant will also be offered shortly, which works similar to the CR-V in that it is an on-demand system with drive channeling to the rear wheels only when slip is detected. The engine in the Mahindra XUV500 in India is the same 2.2-litre mHawk four-cylinder common-rail unit from the Scorpio but gets a variable geometry turbocharger to boost power by 20PS to 140PS developed at a lower (by 250rpm) 3750rpm. Torque is up by 40Nm to 330Nm, coming in 200rpm lower at 1600rpm and staying flat till 2800rpm. The engine retains the intercooler on the top of the cylinder head but there's no bonnet scoop like on the Scorpio, vents neatly integrated into the bonnet channeling cooling air. Refinement levels are good for its class and with the windows up and engine warmed up there's not much noise or vibration intruding into the cabin at low to medium revs. The noise levels pick up towards the top and there is a fair bit of turbo whistle. It revs quite smoothly and responds well to throttle inputs. The engine also gets automatic start/stop (which Mahindra calls Micro Hybrid) to improve fuel efficiency in city traffic conditions. However in our tests the system did trip up when stopped for a long time at the traffic. Transmission is a new six-speed manual gearbox with overdrive on the top two ratios to improve fuel efficiency. Shift quality however leaves something to be desired and it takes a properly hard shove to slot it into first especially when the gearbox oil hasn't warmed up. The clutch is far too heavy for a modern SUV and has a very sharp bite point which leads to the odd stall or two and that makes fighting stop-go city traffic a pain. Thanks to the new chassis the XUV is a whopping 725kg lighter than the Scorpio at 1785kg and that means performance is far better with 0-100kmph taking 12.86 seconds, nearly three seconds quicker than the Scorpio and nearly five quicker than the Innova. And she feels every bit as quick and powerful particularly since there's so much low down grunt. In fact so strong and fat is the torque spread that no matter what gear she's in (okay, not sixth) prodding the throttle always results in enthusiastic response. The surge and turn of speed is strong in every gear and she goes on to clock a top speed of 183.56kmph. This is pretty darn fast but at this speed the XUV is definitely at her limit and the drivers knuckles (and passenger's faces) do turn white. Our test vehicle also had a strange steering vibration at around 120kmph which is probably down to incorrect alignment and we will report on that once we get our long term test XUV very soon. Despite disc brakes all around braking wasn't very impressive with it taking 49.37 metres (and 3.6 seconds) to come to a halt from 100kmph. Brake fade wasn't much of an issue, no more so than any other SUV, but after a couple of heavy brake tests a strange metal on metal grating noise started to come from the brakes. Again something else we will be keeping an eye out for when we put the XUV through a long term test. Thanks to the six-speed gearbox with its taller top ratios fuel efficiency is good with 11.67kmpl in the city and 16.12kmpl on the highway for an overall mileage of 12.78kmpl. The ARAI certified mileage is 15.1kmpl. We were way off. With an impossibly high gadget count we all expected prices to be in the region of 14-15 lakh rupees and were left shell shocked when the Mahindra XUV500 price in India of Rs 11.88 lakh ex-showroom Mumbai flashed up on screen for the fully loaded W8. This is phenomenal value for money and with the range starting at Rs 10.73 lakh for the W6 (no ESP, two airbags, no GPS, no alloys) and going up to Rs 12.81 lakh for the all-wheel-drive variant, success of the XUV500 is all but guaranteed. Don't get us wrong though, the XUV won't sell just because of its pricing. The package is everything we hoped it would be - and more. Great styling, a great cabin, safety features, quick, efficient, refined, comfortable - apart from a quirky name the XUV has everything going for it. If Mahindra can quickly sand out the few rough edges and ensure consistent and high quality levels they have a winner on hand.